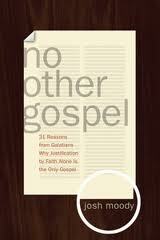 No Other Gospel is a collection of sermons written by Josh Moody, pastor of College Church. This collection actually includes 31 separate chapters and an epilogue that comes in at 275 pages. Being that there are still conversations taking place between Protestants and Roman Catholics regarding the nature of Justification, a book like this can still be helpful for those who espouse an understanding of the gospel in terms out of the lineage of Anselm, Tyndale, Luther, Calvin, etc. Moody stands squarely in that same tradition, one that he shows is found throughout Paul’s letter to the Galatians. The thing about a book of sermons is they will either be really good or really bad. Why? Because sermons are generally really good or really bad, right? Okay, perhaps not always, but in my experience a book of sermons can be boring or difficult to relate to since we’re often removed from the community context that the sermon came out of and was delivered in. But there are some real gems out there (think Martyn Lloyd-Jones!). I think it’s safe to say that Moody can be added to that list of good sermon collections. It’s writing like this that challenges the common concept of “Christian moralism” as a replacement for the biblical gospel, and we would do well to listen to Moody, who is simply fleshing out what Paul wrote for the Galatians. No Other Gospel is a great book. Lots of substance to weigh through, though it is different than a scholarly commentary on Galatians because it clearly was written within a church community for the church community. It’s warm and winsome.